* Sorry! Do to a Steel Price Increase, we can only meet this price until the present supply is gone. * This is like buying a New Chevrolet from the factory, you get a great product at a very low direct buy price! Our best Value, Made in the USA! Select Option: With Anti-Wobble Pin, if you want it. 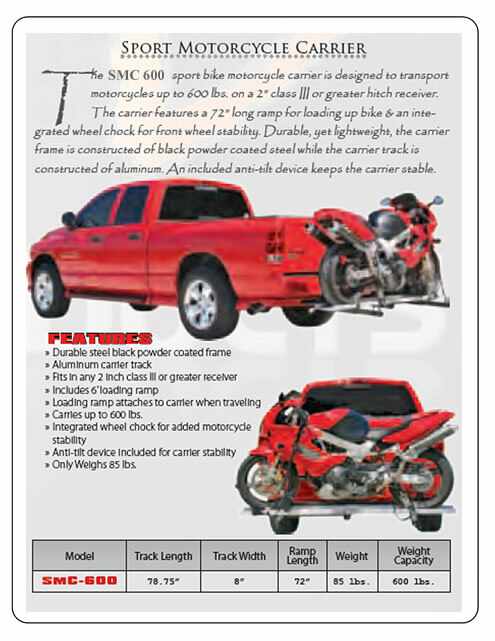 * For 2" X 2"
Great Choice for Sportbikes with up to 200 MM rear tires, or standards up to 600 lbs, Capacity. 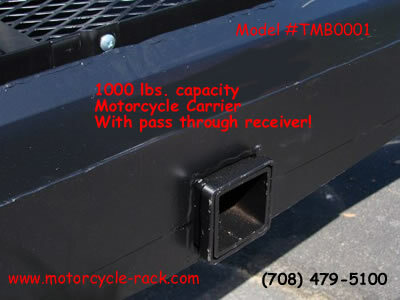 Though the carrier total capacity is 1000 lbs, the carrier where the motorcycle sits itself only supports up to 400 lbs. 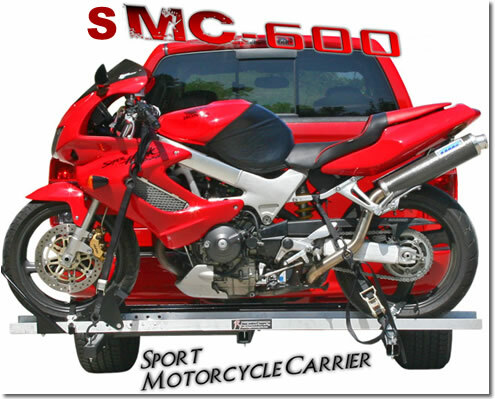 You cannot put one 450-lbs.+ bike on the carrier because that exceeds the carrier capacity of 400 lbs. As an example: the carrier can haul one 400-lb bikes, and 400-lb cargo on the baskets but Do Not load one 600-lbs. bike and 200-lb cargo. If you have any questions, please call. This hitch mounted motorcycle carrier is the solution to transport your scooter or dirt bike. 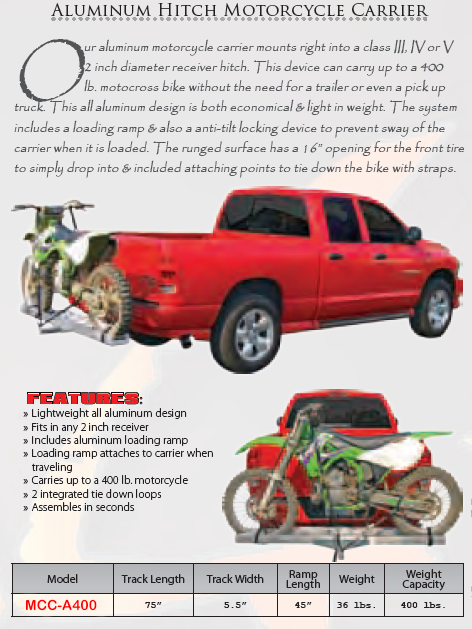 It doubles as a cargo carrier for your gas cans, gear or luggage. 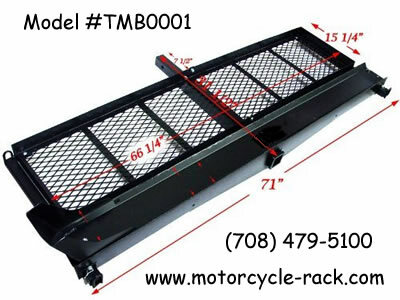 The motorcycle carrier has a 1000 lb weight capacity. 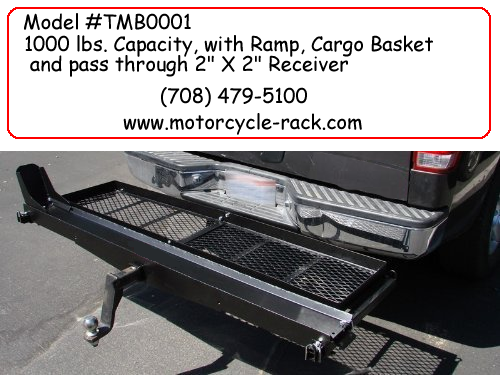 The 58" long x 5 1/2" wide loading ramp stores under the carrier to save space. 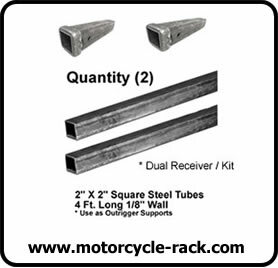 • Main tube length 31 1/2"
• Please check the weight of the motorcycle and measure the wheelbase before purchasing. 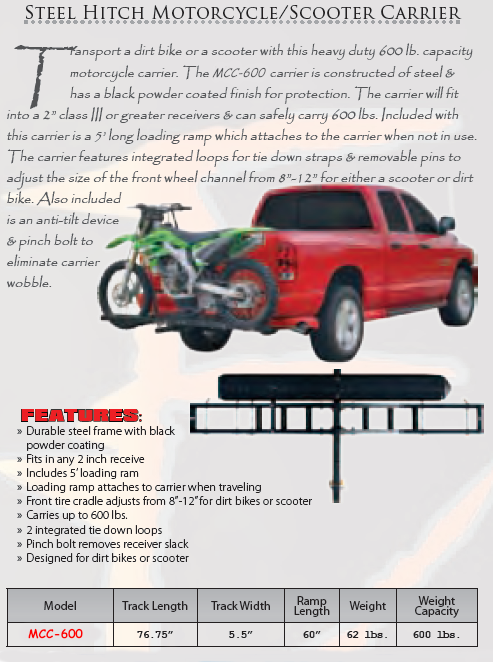 • Hitch Weigh Limit: Most Class III hitches are rated for 500 lbs. Most Class IV hitches are rated for 750 lbs. • Some vehicles may require air shocks or heavier springs to stiffen up the suspension to prevent sagging. • Please check with your dealer to find out your vehicle's carrying capacity.